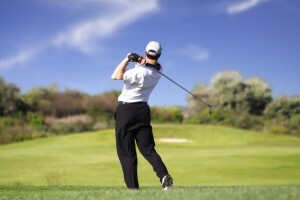 If you’re a golfer in NYC looking to improve your game, you can do so through Clinical Hypnosis. You don’t have to be a professional golfer to come to me. I’ve dealt with PGA golfers to country club members wanting to make a good impression on their peers. Crushed by work and city life, many of my patients are convinced they’ll never get their swing back. A strong mind can compensate for physical weakness, but what if confidence and concentration are deteriorating too? In therapy, I will pull you through meditative exercises that enhance the reflexes your body undergoes behind a powerful swing. You learn, through routine practice (that will itself take effort to be comfortable with), to put away the emotional obstacles that keep you from hitting the ball where it has to go. Very few hypnotherapists in NYC, if any, can give your particular style of golfing the attention it requires. I have the experience and expertise. Give me a call to schedule a session (212) 599-3195. Go here to learn more about sports hypnosis. This entry was posted in hypnosis nyc, sports hypnosis and tagged hypnosis for golf, nyc hypnotherapists, sports hypnotherapy by Dr. Errol Gluck. Bookmark the permalink.